41 Orchard have a beautiful range of nursery wall decals and kids wall stickers that are perfect for decorating a little ones room. Nursery wall decals are an easy and affordable way to add colour, fun and character to a kids room. We have many modern and well designed kids wall stickers that will suite any décor & budget. All 41 Orchard decals are removable and will not damage your wall surface. When its time to remove them or update your wall decor, simply peel back the decals leaving your surface in tact. For modern nursery décor, geometric pattern wall decals are so on trend at the moment. 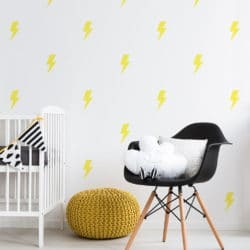 Kids wall stickers are a simple and affordable way to create a wallpaper look or an attention grabbing feature wall in your nursery. We have several wall sticker pattern designs including polka dot wall decals, hand drawn dot decals and triangle decals. All of our pattern wall decals are available in a wide selection of colours so you can easily match something to your nursery colour scheme. Our favourites are the tribal wall decals and cloud wall decals, they can be arranged randomly or in a grid and both are available in several colour options. You will be impressed with the quality of our wall decals, we use high quality materials for the Australian market. The matt finish vinyl that we use is specially designed for home decor use on internal walls. This means our nursery decals are are 100% wall friendly and will not damage your wall surface in any way. Wall decals will stick to almost any smooth surface such as painted walls, furniture and glass. At the same time, the adhesive is gentle enough to not cause paint chips when removing. Nursery wall decals are easy to install and easy to remove. They will not peel off over time like many cheaper vinyl decals, but when you do want to remove them, simply peel back and there is no damage or sticky residue left on your wall. All of our designs have many colour options making it easy to find the perfect wall decal for your nursery.